The Fairmont Vancouver Airport hotel is the only soundproofed, luxury hotel and spa conveniently located within Vancouver's International Airport. Situated directly above the US departures terminal, the hotel is only a two-minute stroll from the luggage carousels. This AAA / CAA 4-diamond Vancouver airport luxury hotel features soundproofed guestrooms with breathtaking floor-to-ceiling views, diverse dining choices and an indoor pool, health club and spa. 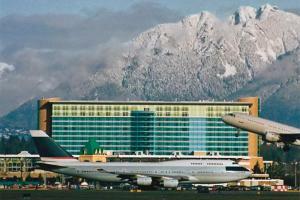 The hotel is approximately a 5 - 10 minute walk from the Vancouver International Airport. Richmond Olympic Oval, Escape Key, Iona Beach Regional Park.